Spaghetti and meatballs or marinara sauce is a classic American comfort food, but sometimes the pasta gets lost in the sauce. 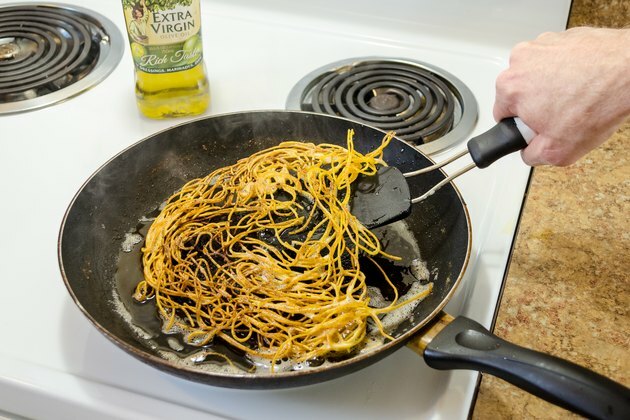 Frying pasta opens up a whole new world of possibilities, from serving it up as a crispy, caramelized side dish to using it as the starchy base of a stir-fry that incorporates other tasty ingredients like veggies, mushrooms or strips of chicken and steak. 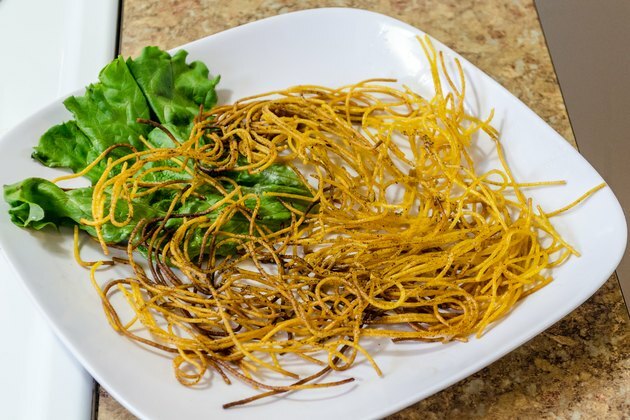 Choose long, thin forms such as spaghetti, vermicelli or angel hair, as they fry up quickly without getting mushy. Cook the pasta of your choice in plenty of salted water according to the package directions. Undercook it slightly, or to the al dente stage, where it retains some of its chewiness, as it will finish cooking during frying. Drain the pasta completely in a colander -- but don't rinse it -- and spread it on paper towels to dry. Heat equal amounts of olive oil and butter in a large heavy skillet over medium to medium-high heat, and bring to just under the smoking point. 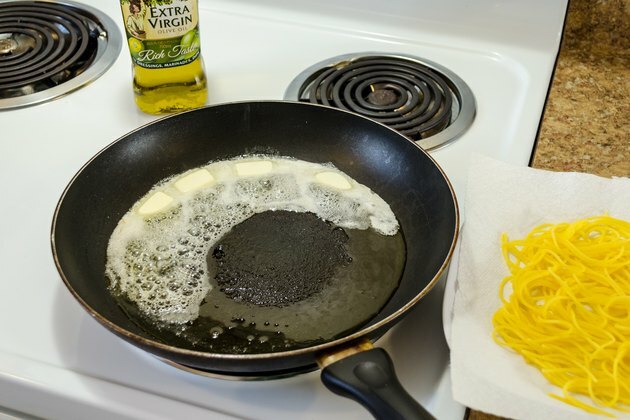 Add only as much drained pasta to the oil-butter mixture as will comfortably fit in the pan and spread out as evenly as possible. 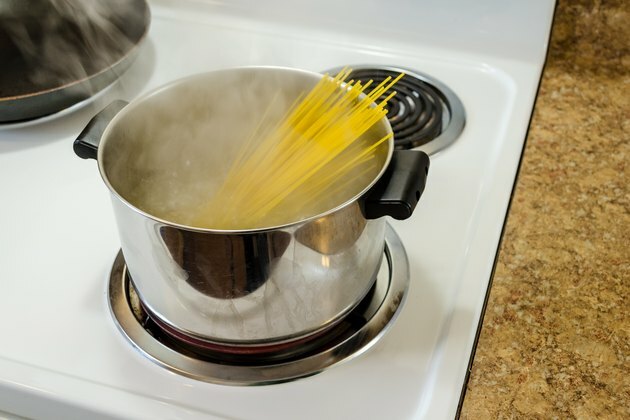 Reduce the heat to medium, press down gently on the pasta with the spatula and cook for 2 1/2 to 3 minutes, lifting the edges occasionally to check for a golden-brown color. Slip the spatula under the center of the pasta and turn over, repeating this step for any sections that break away. Press lightly and continue cooking for another 2 1/2 to 3 minutes, lifting the edges to check for doneness on the second side. Slide fried pasta out onto the serving platter and serve immediately. 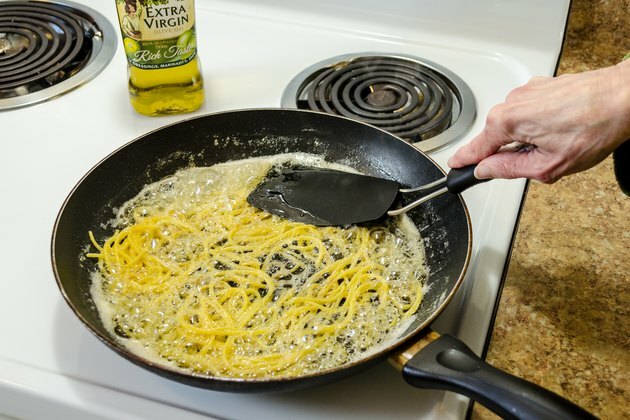 Fry the pasta in small batches rather than one large one, adding more oil and butter if the pan seems dry. This keeps the oil and butter hot and assures more even crispiness in the finished noodles. To incorporate meat into fried pasta, be sure it is sliced very thinly so that it cooks quickly while the noodles crisp up. Steam vegetables such as matchstick carrots, snow peas or broccoli florets before adding them to the skillet. Saute thinly-sliced onions or minced garlic until just tender before adding the drained pasta to the skillet. When serving fried pasta, have salt, pepper and grated parmesan cheese on hand as additional seasonings.